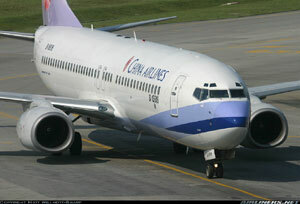 On August 20, 2007, a Boeing 737-800 operated by China Airlines departed from Taiwan, Taoyuan International Airport on a regularly scheduled flight to Naha Airport, Okinawa, Japan. Following landing and leading edge slat retraction, a failed portion of the slat track assembly was pressed through the slat track housing and penetrated the right main fuel tank, causing a fuel leak. At about 10:33 local time, fuel that had been leaking from the right wing tank during taxi and parking was ignited by hot engine surfaces and/or hot brakes, resulting in the aircraft being engulfed in flames. There were 165 passengers and crew on board, consisting of eight crewmembers and 157 passengers (including two infants). Everyone on board was evacuated from the aircraft with no casualties. The aircraft was destroyed by the fire, leaving only part of the airframe intact.